Check the first part of this article here and the second part here. 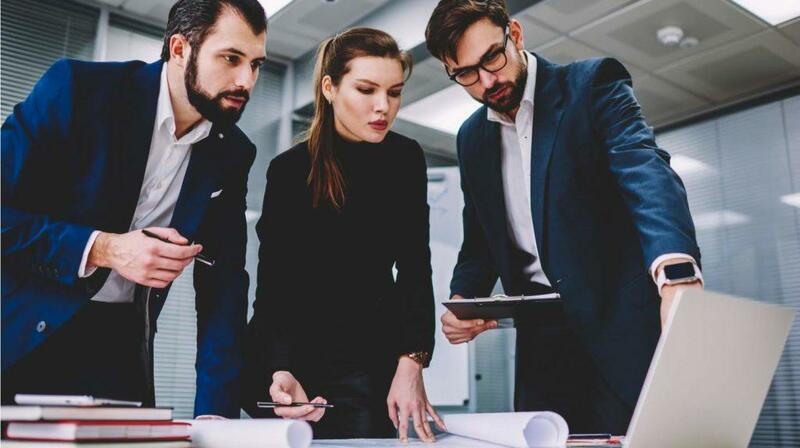 The ability to engage employees in the strategic objectives of the organisation and a clear focus on building capability for the future will differentiate successful businesses from the rest. By updating your L&D skillset and practices, there is the opportunity to replace anxiety with excitement and play the lead role in your organisation’s success both today and tomorrow. Let’s see, for starters, what data have to do with this goal. The challenges practiced in assessment were neither pressing concerns or realistic enough for deep learning to take place. In addition to ROI, traditional measures of L&D have mainly been: attendance, completion, assessment, and satisfaction. These assume that ‘learning solutions’ (and more often ‘formal learning solutions’) are the answer, to which there will be a cost to the company but rarely a linear value that relates to a ‘return’. It is easy to measure attendance, completion, assessment, and satisfaction. However, none of these logically equate to ‘learning’ or ‘performance improvement’. Assessing and measuring improvements in performance and increased capability to do the work required are steps towards efficacy: achieving the desired results. This is in stark contrast to measuring whether ‘learning’ has occurred. The ‘course mindset’ is pervasive and likely to be deeply ingrained in the development experiences of key stakeholders, including your managers, peers, clients, and anybody who asks for ‘courses’ for themselves or for others. The majority of people have invested a part of themselves and / or their reputation in ‘training’. You need to be both skillful and sensitive to this and share a compelling vision that leads your organisation and its people to a far more effective L&D experience. In this respect, remember to protect and yet inspire them as you lead. Whilst a potential minefield, politically, this L&D transformation is a journey worth initiating. It is one thing to express the case for change and to share the vision of how L&D can play a more critical role in modern business and yet another to lead the transformation required. The reality many of us face is that despite being ready to operate within a modern L&D function, the setup is governed by traditional expectations, often from others with significant influence. In many cases, cultural factors may determine that traditional L&D is served with a blind disregard for what actually works. Remember, you’re leading people on a journey and there will be pitfalls along the way. However, you will find advocates and it will be important to leverage their influence and involvement. 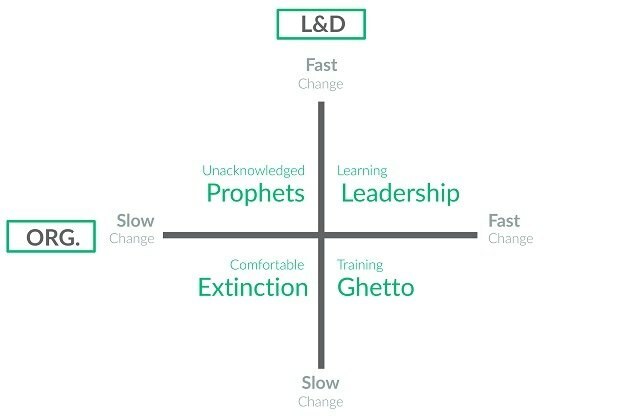 The only logical place to be on this axis is in Learning Leadership, where the pace of the business requires a progressive and highly impactful approach to L&D. Here, the business is integrally supported in its own progressiveness by the Learning & Development function. If L&D is moving too fast for the business (Unacknowledged Prophets) then there is a lack of leadership recognising that the aim of leading (in this context) is so that others follow, so it may require some ‘pacing’ at first to convince and reassure people that another way will yield better results. The places that you do not want to be occupying are those of slow-paced or traditional L&D. Comfortable Extinction means that the organisation is likely to no longer require development because it is not going to be around for too much longer, or the Training Ghetto, where the organisation is likely to be allocating resources to bypass L&D and serve its own needs, leading to questions as to why you are there at all. You will find out where you are from an honest self- assessment and the data you collect. Then, and only then, can you plot your path, leading so that others follow. Comfortable Extinction is a difficult position to move from because it indicates that the organisation is stagnating, if not declining. But anywhere else, our simple mantra ‘help people to do what they want to do, better’ will help you to move towards Learning Leadership. Moving beyond learning and exploring L&D’s critical new role should be exciting, if not a little daunting. But you are not alone. Here is what you need to keep in mind. Liberation from the ‘course mindset’ can begin to refocus the L&D function on helping the business to achieve its strategic goals, supporting everyday working, and growing capability so that employees can achieve their potential in your organisation. This is a much bigger and more important role for L&D and has the opportunity to impact everybody, every day rather than very few people, not very often. L&D and employees themselves have been misled by the limitations of corporate learning technology to this point. However, the opportunity with technology lies on an adjacent path, one that employees recognise the value of because it helps them to do what they want to do, better. By providing resources when and where employees are facing work challenges, by unpacking what an organisation knows and needs to know in order to perform, and recognising that employees can be motivated to develop themselves with the right tools, then L&D can be integral rather than peripheral. This requires refocus, bold leadership, and an agile and collaborative approach. And it requires a new digital skillset. 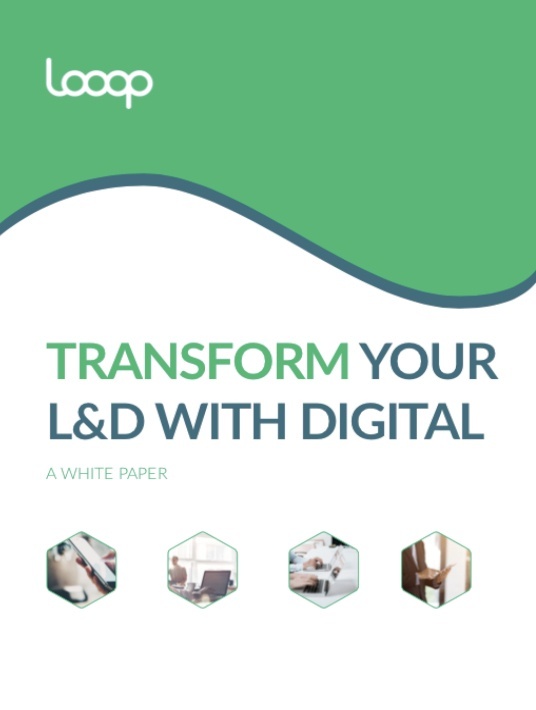 If you want to learn more about the digital transformation of Learning and Development, download the free eBook Transform Your L&D With Digital. Are you in the Training Ghetto?